Cross the Harrison River above Wairereata Falls and follow the east bank until opposite the South Ridge of Te Hau. Steep climbing up a watercourse leads to the ridge between Benton Peak and Bowen Col. Continue past the col and over Mitis Peak to a gap in the ridge which is passed easily via ledges on the Harrison side. Regain the ridge and climb two steep rock steps to the summit. Access is via a shelf above Selwyn Creek (Harrison Valley), accessed by first ascent party via Tutoko Valley and Grave Couloir. Good campsites and poor bivvy rocks on the shelf. From the shelf gain steep slabs at 1500m and climb up and right to reach the crest of the North Rib, which can be followed for most of the route (crux grade 16). First ascent party traversed west of the rib twice on the lower half of the route, and briefly to the east 100m below the summit. Rock quality on the route is poor on most of the climb, except for the water-worn approach slabs, and heavily vegetated below 1950m. First ascent party soloed the route except for five 20-35m pitches: two at the start of the rib; two to gain the rib after the second traverse west; and one at the top of the rib. Abseil descent (single rope abseils recommended due to blocky rock; a rope jam at 2170m resulted in a forced bivvy – cold!). Party walked out via slabs below Ngapunatoru Plateau, Lake Never Never, Lake Pukutahi and Harrison Valley. From the top of Grave’s Couloir take the easy ridge to the base of the North Wall, then climb steep rock for 150m to snow slopes and the summit. Start from the foot of Grave Couloir, 150m above the valley floor, and traverse left on broad terraces to a rib that leads to the North Ridge. Involves some steps of about grade 10 to exit the couloir but becomes easier with height. Grave’s Couloir is a 1200m snow and ice couloir up to Tutoko Saddle. 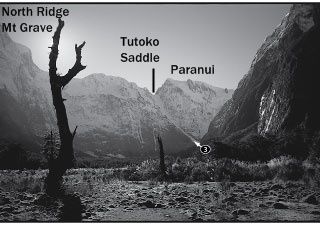 It is the best route out of the head of the valley to climb Mt Grave and provides access to the Ngapunatoru Plateau. The couloir is prone to rock-fall in rain and warm weather and may be very broken late in the season. If this is the case it may be possible to exit the couloir at half height heading directly for the North Ridge of Grave, then traverse this back to the saddle. The South Ridge snakes along for 8km between Barren Peak and Mt Grave, ascending roughly 650m. It provides some very good climbing with excellent protection on solid granite for the first 6km, however the final 2km is made up of loose rock and numerous gendarmes on a razorback ridge, with steep drops into the Bowen River on the west and the Tutoko River on the east. Travel time from Barren to Grave approx 18 hours. Descent via the West Ridge of Grave to Bowen Col and then down the Harrison River. The party spent three and a half days ascending the ridge on the first ascent.